The goal of a spiritual support group is to ensure that no one feels alone in his or her struggle with mental illness. Sharing each other’s stories can be a liberating and welcome break in the silence that often surrounds mental illness. A spiritual support group is a place to speak out and be heard in a safe, confidential, and non-judgmental environment, where isolation and stigma dissipate as a supportive community is created. A spiritual support group is not group therapy but a ministry in which members seek to help support others during their time of need and to grow spiritually in their relationship with God. Examples of ways to announce the purpose and availability of a spiritual support group for people with a mental illness and/or a group for the parents, families and friends of people with a mental illness. 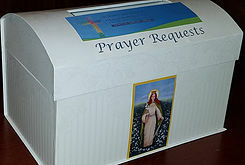 For the support group meetings prayer intentions can be placed in a prayer box that is kept in a sacred space, such as a chapel. Once the box is filled with intentions a prayer service can be held where the intentions are burned, as prayers rising to God. This is a good prayer to use at the beginning of a support group meeting.